I am ecstatic. After having read about Internet Marketing for 1,5 years; after having bought books, dvds, software, and cds; after receiving 10,8 tonns of "helpful" email messages, I've finally been able to set up a website that is making money. I have read this a thousand places, but I really didn't believe it until I tried it myself. The truth is: it is fine to be an affiliate, but you have to create your own business first. It is after you have created your own business that you can start selling other people's products to your customers. Okay, let's back up a little. Forget about the affiliate marketing for a while. I have several websites that are purely affiliate-sites -- and they are making some money, maybe $100 - $200 a month -- but that is far from good enough. It was just so easy, not having my own product, not having my own customers to worry about. But once I got a product, everything changed -- for the better. You've been told 3,459 times that mini-sites don't work. A mini-site is basically a three-page website. The first page is your sales letter -- the letter that makes your website visitors drool with want for your product. The second page is where they pay. The third is the thank-you-page. It is where they get to download whatever it is you're selling, if you're selling digital stuff (eBook, mp3s), or where they are notified that what they've purchased will be shipped within the next 24 hours. Well, I finally created my own product -- an eBook (i.e., a pdf-file), set up a mini-site with a sales letter, had ClickBank manage payments (and affiliates -- my affiliates) -- and started buying traffic on Google. Boom! I'm making money! When you buy traffic (i.e., website visitors) like that, it's easy to loose money. I'm very happy I got a hold of Perry Marshall's course on Google AdWords (he's got some free email lessons as well). Not to be greedy or anything, but the taste of success is damned sweet. 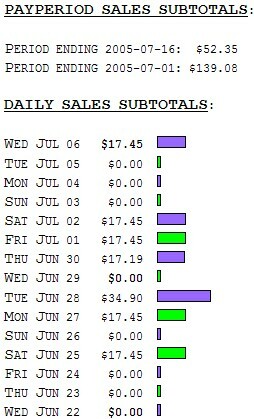 I know my website converts (i.e., turns visitors into buyers), so now I need more traffic. As much as I can get. As cheaply as possible.